Dracula is one of the most popular vampire stories that includes everything from thrills to romance. NetEnt and Universal have both come up with a way to present the theme in a video slot while also including some great bonuses and graphics. This 20 pay-line slot captures winnings from left to right on 5 reels holding 4 symbols each. Furthermore, bonuses such as wilds, a bat feature, and free spins all come together and offer a unique insight into the world of Dracula. Impressive winnings up 200 coins are accessible by regular symbols while bonuses boost winnings to huge values. NetEnt has ensured some of their most impressive abilities are featured with this branded video slot, which is clear from the very moment the game has loaded. Each aspect of the game has been animated, stating in the background where Dracula and his lover appear with different colours in the sky. The reels take up most of the screen and offer a neat gaming platform of symbols that also become animated in a win. These symbols include Dracula, His lover, other characters from the story, and poker favourites with a golden frame. Along with the impressive range of animations and graphics, NetEnt has also created a betting panel that shows the options in red and black to better suit the theme. However, all the regular options are featured, including 1 to 10 coins per line (bet level), and coin values from £0.01 to £1.00. The features all come together and offer a total wager value from £0.20 to £200.00 per spin. Dracula video slot provides the regular features from NetEnt with a number of unique aspects and rewards. The winnings presented can be activated with any wager amount and players can activate all the winnings possible as pay-lines are not adjustable. The standard game includes a symbol with a red W. These are seen on reels 2, 3, and 4 during any spin. These have the ability to copy others and offer more winning combinations for any symbols. The game doesn’t have any scatters, meaning the wilds are enabled to boost winnings. However, they cannot trigger the free spin feature. Players will find the lady and Dracula are the only symbols that can cover 3 symbols at a time. Dracula can show up on reel 2 and the lady on reel 4, should this take place simultaneously, the free spin bonus will be triggered. You will receive 10 free spins, and the couple will meet on reel 3 to offer a stacked wild. Each time the couple appear, you will also receive another 2 free spins. With any spin, you could find a wave of bats flying over the reels and landing on symbol positions while the reels are still in motion. Once they stop, all the symbols positions covered by bats will consist of the same value for a bigger reward opportunity. Dracula is a video slot that impresses from the very moment it has loaded. The game has fun and rewarding features and offers regular payouts as it is a medium to high volatility slot. Players can enjoy return rates of over 96%. 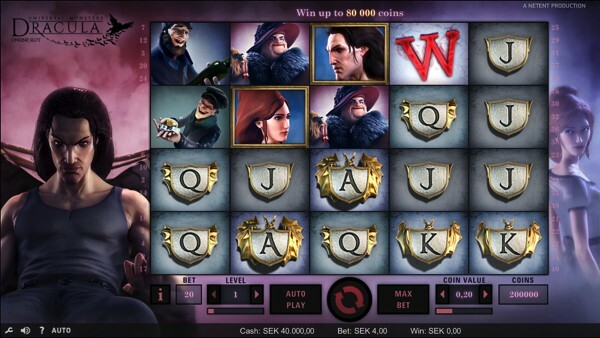 Dracula is a popular slot from Net Entertainment. The game can be found at great casinos like Casino Heroes and Casumo.